with Paradym 3.1 Industrial Control Software. 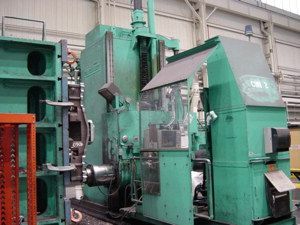 The machine structure is of the “Fixed Work, Traveling Spindle” type. outer Spindle inside a 14” Quill. The outer Spindle moves WITH the Quill in the “Z” axis. by sleeve bearings, and also moves in the “Z” axis. Manual Mode – X,Y,Z, = 0.5 - 150 I.P.M. Numerical Control Mode – X,Y,Z, = 0 - 150 I.P.M. Rapid Mode – X,Y,Z, = 150 I.P.M. Spindle Speeds: 18 – 1800 R.P.M.